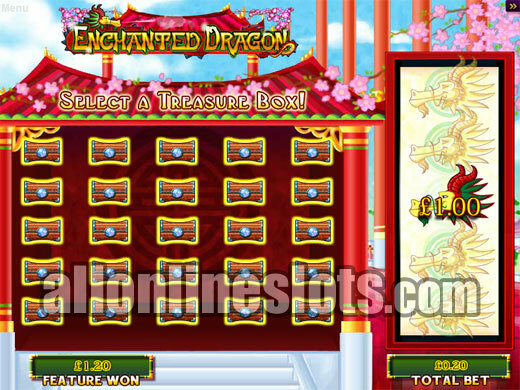 Enchanted Dragon is a WMS Gaming video slot with an Asian theme, 20 pay lines, an interactive pick a box bonus, a gamble option and a top jackpot of 5,000 coins. The game is found online exclusively at Jackpot Party online casino. UK Players Only : At the moment WMS online slots are only available for players located in the United Kingdom. If you're not in the UK we suggest looking for other Slot Machines. 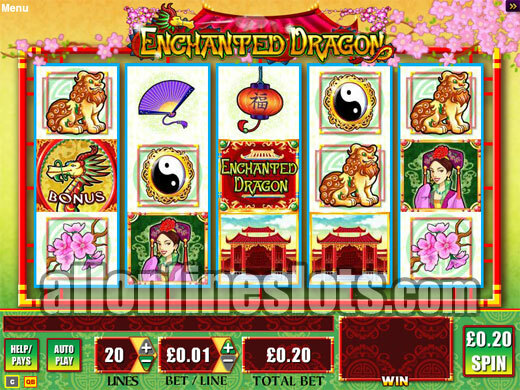 Enchanted Dragon is a 20 line video slot with a Chinese dragon theme from WMS Gaming. The game is part of the I-Play series and offers a pick a box style bonus feature as well as the option to gamble your winnings. If you're a fan of WMS's Egyptian Riches slot you'll like Enchanted Dragon as the game play is identical. 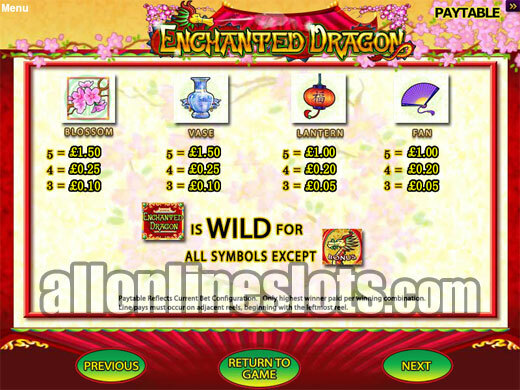 The Enchanted Dragon logo is the highest paying symbol with five on an active line awarding a big 5,000 coins. The Logo is also wild for all other symbols except the scattered Dragon Bonus symbols. Getting four wild Logo symbols aligned left to right pays the second highest reel based jackpot of 1,000 coins. After the top two pays the next highest line wins for five symbols are 700 coins (Princess), 500 coins (Temple) and 250 coins (Yinyang or Lion). The rest of the five of a kind wins range from 150 coins to 100 coins. The scattered Dragon Bonus symbols pay in any position on the reels with three or more triggering the Enchanted Dragon Feature. There is an extra reward for hitting four or five scatters as all bonus winnings are then paid at X2 or X4 respectively. Once you've triggered the bonus you move to a second screen stage where you select one of six Dragons (Preview) to reveal a prize of between 1 and 7 times your total bet. You then select chests to reveal prizes of between 1 to 6 times your total bet plus the amount you uncovered on the original Dragon selection (Preview). You get to keep picking chests until you uncover a Collect symbol. You can also uncover a Pick Again symbol which lets you pick another dragon and in turn increases any further successful picks on the chest stage. If you hit five scatters you're looking as some big wins with the Dragons paying up to 28 times total bet and the picks up to 24 times. 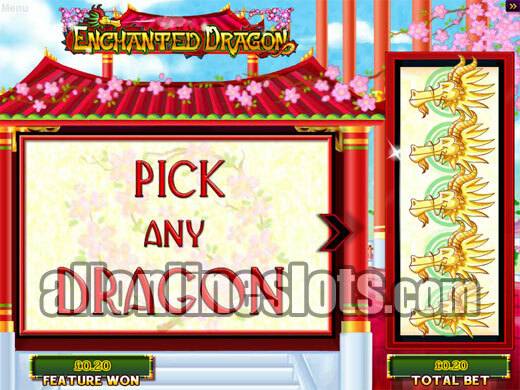 As well as the reel based features, Enchanted Dragons also has an optional gamble feature where you can try to increase your winnings from the spin by selecting either red or black. You can keep doubling up until you have five doubles or reach 5,000. 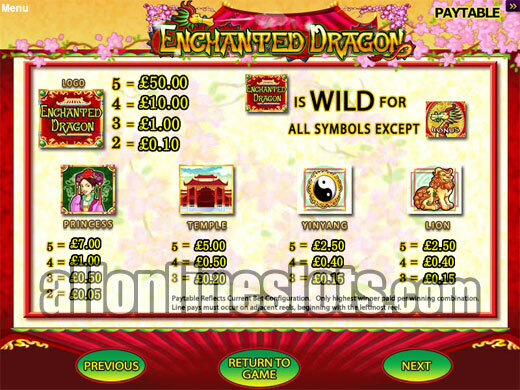 Enchanted Dragon is also connected to the Jackpot Party Progressive link. This feature can hit at any time and awards a shot at a Jackpot Party bonus feature (Preview) where you can collect star symbols to win one of the five site wide progressive jackpots.